Toxoplasmosis is an infectious disease caused by a microorganism toxoplasms gondii. These are the parasitic protozoa of the family can infect pets, mostly cats, and through them the people. The infection is spread through the feces and raw meat. Symptoms of the disease are harmless - in humans and animals like the common cold. However, toxoplasmosis is very dangerous for pregnant women as it can harm the unborn child. In case of infection during pregnancy, the risk of congenital toxoplasmosis and infecting the fetus is 30-40 percent. The greatest risk is during the third trimester of pregnancy - about 70 per cent, and lowest at the start - 15 percent. Toxoplasma infection can cause miscarriage, premature birth, stunted growth, blindness, hydrocephalus syndrome, brain damage, epilepsy and deafness. Therefore, it is important to know what to do to reduce the risk of the disease to a minimum. If you suspect that you are infected with toxoplasmosis, or that you have suffered, it is best to test with your doctor. It is well tested and a cat, because they rarely show signs of infection. Test toksplazmozu performed by a vet and via feces and blood of animals. Toksplazmoza is a disease that is transmitted through feces and raw meat, and the greater the likelihood that your pet "pick" out there, "feasting" with various "goodies". During pregnancy, do not take the cat to the house from the street because of the risk of infection. Pet food, as well as all family members, you should be well cooked. This is especially true for meat and eggs that should not be consumed raw. Remember that most preparations of meat products raw meat! This is especially true for washing fruits and vegetables that may have come into contact with cat faeces.Wash all utensils used in food preparation. 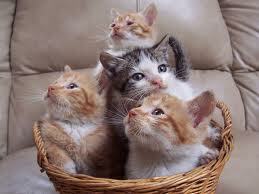 Pregnant women should, if possible, clean the litter box in which the cat evacuating. If this can not be avoided, it should definitely wear rubber gloves. If you are "old" cat owner, you may have the disease without knowing it suffered. In this case, your body develop immunity and risk of infection exists. It is important to emphasize that the pregnancy does not have to give up your pet. Adhering to the above advice, women without fear can not live with a cat, and enjoy all of her beautiful cat can provide.